This is Thailand's version of the ASEAN Architecture 2007. 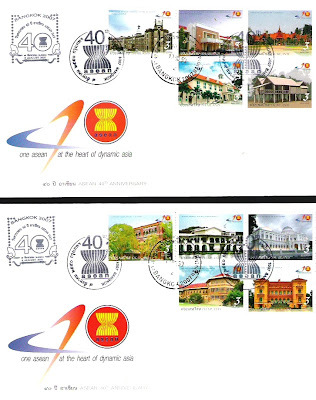 You have seen the stamps before as all the ASEAN countries (all so far, except Brunei and Myanmar) are issuing the same stamps depicting the same buildings. I have shown Singapore, Malaysia and Philippines which placed all the stamps in one envelope. This Thai one separated the 10 stamps into 2 sets - and you have to buy two First Day Covers. Clever marketing that. I am still waiting for my Indonesian FDC. The Indonesian one comes in three sets - two for the 10 ASEAN stamps and a separate one for the Indonesian stamp - even more clever marketing. How many people have seen a $1000 note? I guess not many unless you happen to be working in a financial institution or where I am. But then we don't come across that many $1000 notes either. This particular note was interesting. This lady came in with a bunch of currency notes of various countries and various denominations. Her family used to be a collector but I guess the the current generation are not as interested in being collectors and now want to cash in the collection. It has never been our institution's policy to purchase currency notes from private collectors. I decided to have a personal look and lo and behold! I found this $1000 note which she had and willing to part for substantially more than the face value. Of course notes like this are very rare. 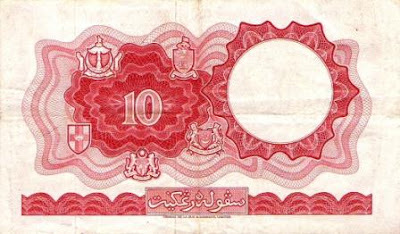 This particular note, now in my album, was the first $1,000 note issued by Brunei. There were two issuance, one in 1979 and the latter in 1987. 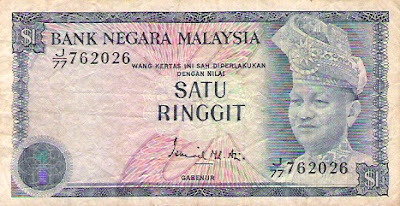 This note come under the 1972 series and this is the highest denomination of the 1972 series. I showed the $500 note about a few days ago. This and the $500 note are the only two notes to carry this particular portrait of His Majesty's. 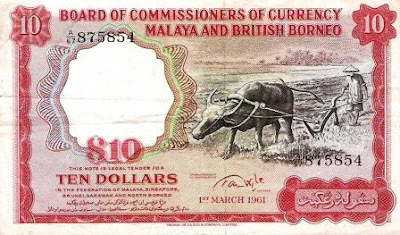 This is also quite rare as not many people use $500 and $1000 note in those days. 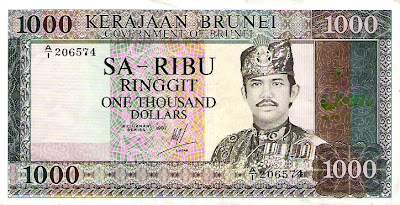 This is also one of the largest notes (size wise) in Brunei's collection. It barely fit into my album. The $10,000 of the 1989 series would be the only one to beat this particular note when it come to size. My Malaysia Ringgit collection is growing. The top $5 is my latest acquisition and the lower one arrived about a month back. In terms of issuance, the top $5 was issued in 1972-1976 while the lower one was from the 1986-1987 series but this particular note was issued in 1995. There are two differences between the actual 1986-1987 series, one is the signature of the Governor (original signed by Tan Sri Dato Jaffar Hussein, the latter signed by Tan Sri Dato Ahmad Mohd Don) and the other is the disappearance of the cross from the design (seen on the reverse). It is amazing what ebay can throw up. Three months ago, I did not own a single historic coin of Brunei. Today I own half a dozen, with the sixth arriving yesterday. These 'duit bintang' which I have written about in the past was issued by Sultan Hashim. 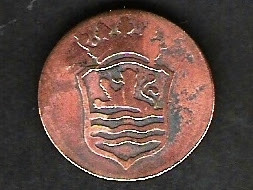 These were minted at Heaton, Birmingham in 1886. The Mint at Heaton produced hundreds of millions of coins for countries around the world from 1850 until its demise in 2006. This is a short story of what happened to that mint. The mint at Heaton now known as The Birmingham Mint, was originally known as Heaton's Mint or Ralph Heaton & Sons. It started producing tokens and coins in 1850 as a private enterprise, separate from, but in cooperation with the Royal Mint. For those who lived in Birmingham or know Birmingham quite well, its factory was situated in Icknield Street, on the edge of the Jewellery Quarter. It was created by Ralph Heaton II, using second-hand coin presses bought from the estate of Matthew Boulton. Matthew Boulton created the Soho Mint around 1788 but the company did not survive. It was on April Fool's Day in 1850 that Ralph Heaton II bought the eqiupment mad eup of four steam-powered screw presses and six planchet presses for making blanks from strip metal. 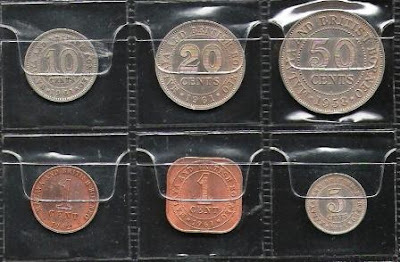 These were installed at the Bath Street works, and in that year trade tokens were struck for use in Australia. 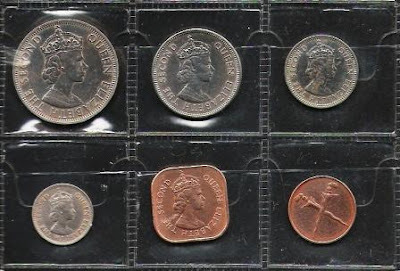 Other coins started to be minted for Chile and for the British Royal Mint. It also struck coins for Napoleon and for a time operated the French Mint. They won more and more work and during its peak struck around 110,000 coins a day. By 1862 it was the largest private mint in the world. In March 1889 it became a public limited liability company and renamed The Mint, Birmingham, Limited. In 1912, its first competition was the Kings Norton Metal Company. Kings Norton became part of Imperial Chemical Industries (ICI) in 1926 and was reorganised as part of Imperial Metal Industries Limited (IMI) in 1962. The Mint started spiralling downwards. By May 1935 it moved into non-ferrous metal sheet and tube productions with coins accounting only some 10% of business. From this time the production of coins became a small part of the overall business of non-ferrous metal sheet and tube production. Bomb damage during World War II left the factory run-down. 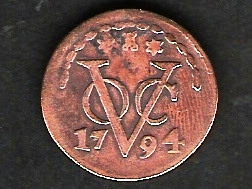 In later years, the plant became increasingly busy with the introduction of the Euro within the European Union; the mint produced several million €1 and €2 coins. However, a slump in trade and contractual agreements between them and the Royal Mint resulted in the sale of the mint in late 2003. The Mint was acquired by JFT Law & Co Limited who still produce and sell commemorative coins and medals from a website. Substantial parts of the plant and machinery were subsequently purchased by an Indian company, Lord's Security Mint Limited. The POBJOY Mint purchased the newest high speed presses plus new tooling. Most of the complex, excluding the Icknield Street block and the rear, retaining, wall, was demolished in April 2007. 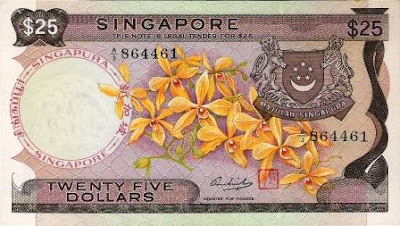 This is the first Brunei $500 note. 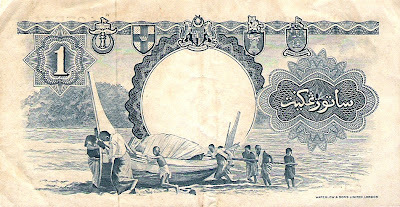 This particular note was issued in 1987, twenty years after Brunei first issued its own currency notes. However this note was first printed in 1979 before a second printing in 1987. Theoretically speaking this note has a value of $500 if you happen to go shopping with it but among collectors, this note is worth several times that much. The interesting thing is that this particular portrait of His Majesty only appeared like this on this note and the $1,000 note and nowhere else. 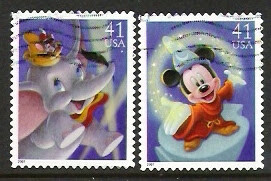 Disney products always look cute even when they are placed on stamps. These 2007 stamps from USA look just like that. These two stamps came from a set of 4 stamps - the other two are Sinbad and Peter Pan. USPS (US Postal Services) have gone for the commercial market nowadays. Star Wars stamps, Comic Hero stamps, Disney stamps. I am not sure it is such a good thing but for the postal services, they needed to make money and stamps sell. Perhaps that's an area our postal services should go for too. After all, there are many countries in the world dependent on their stamp sales. 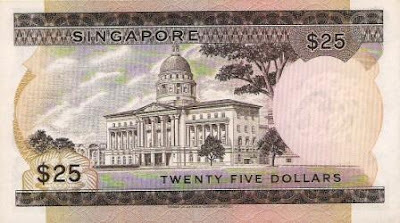 I have almost gotten all of the Brunei and Singapore notes apart from the $500 onwards and lately I have turned to Malaysian notes. I am bidding for a few notes and I have been able to get my hands on a few notes lately. 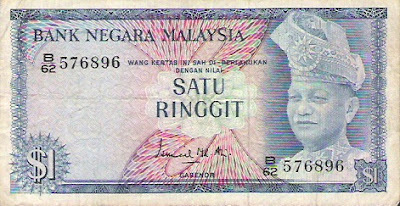 The latest I have managed to get is the above $10 Malaysian note which is the 4th or 5th series, if I am not mistaken, released in 1981-1983. 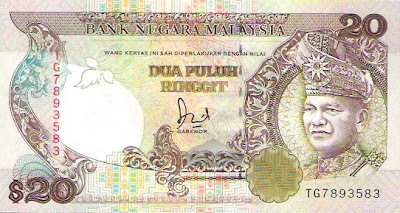 The only difference between this one and the one issued in 1976-1981 is the signature of the Governor of the Bank Negara. 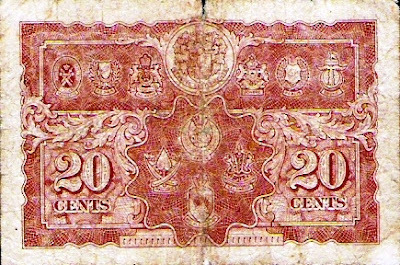 The above is a 20 cents paper currency note issued in 1946, soon after World War II. It was printed in 1941 on a paper currency note as the British were afraid that they need all the metal for the war rather than printing coins. 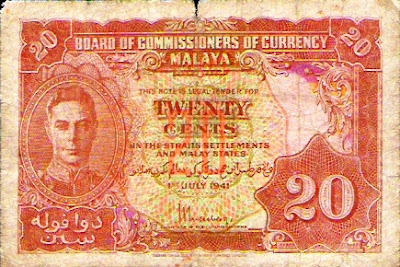 As it were, these paper coins were not used or sent to Malaya until after the end of the World War even though they were printed in 1941. There is actually a 20 cents metal version which was more popular but this note served as a transition period currency note and for that it worthwhile to keep it. 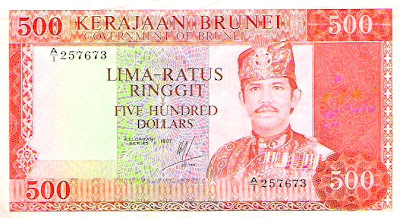 If you look on the back of the note (obverse), you can see Brunei's panji-panji which means this note was also used in Brunei. This is an unusual philtelic item. 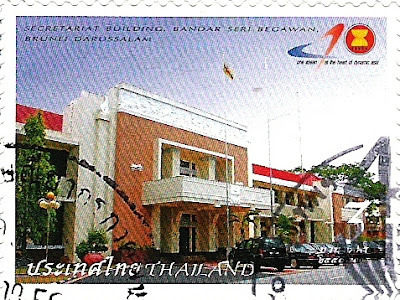 In September 2000, the postal authorities released this commemorative postcard to commemorate the opening of the Postal Services Branch at Brunei Shell Petroleum Panaga, Seria. It was opened by the then Minister of Communications, Pehin Dato Haji Zakaria. That post office branch was originally run by BSP. 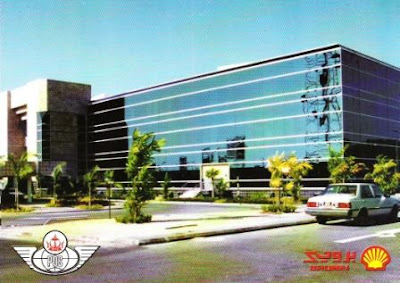 The photograph shows that of BSP Headquarters. 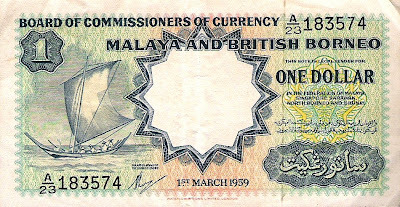 The early Malaysian banknotes to me are the most dull of the three former Malaya British Borneo Board of Commissioners of Currencies. 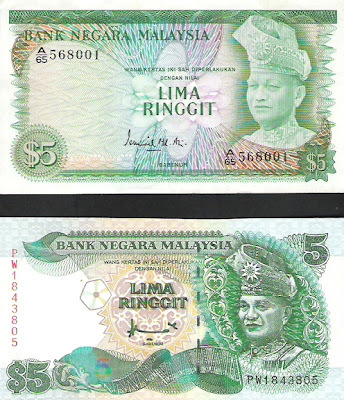 These two banknotes represent the Malaysian design from 1967 to 1984. The main difference between the two is that latent image (guilloche) at the bottom left corner. 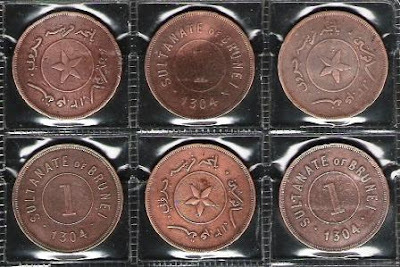 Four series were issued in the 17 years but each of the design above appeared twice with very minor changes that only a collector can discern the difference. It was the subsequent designs from 1984 onwards which are more exciting. My mother in law gave me this $1 note yesterday. I know the history of this $1 note quite well even without looking it up. This $1 was issued in 1959 to replace the $1 note which bore the portrait of Queen Elizabeth II which was issued in 1953. 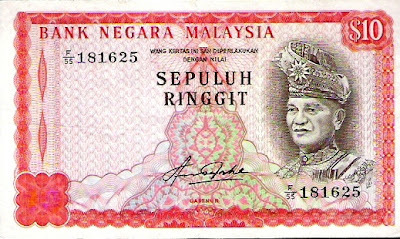 This is the last $1 note that Malaysia, Singapore and Brunei used before each of three countries produced their own note in 1967. I am always intrigued by how the authorities wanted a common identity. You have to bear in mind that the notes issued prior to this one had Queen Elizabeth, King Edward and King George. 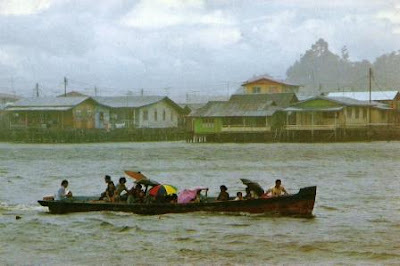 The common identity they could come up with was this small fisherman sailing boat. Anway, this particular note that I have is more valuable than the usual $1 note of the same design. This note is printed by Waterlowe and Sons who was the first printer. Subsequent ones were printed by Thomas De La Rue. Since Waterlowe did not print that many, any $1 note printed by Waterlowe automatically has a double value of whatever the value of this note. 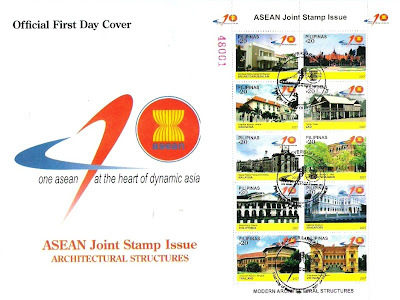 This is the Philippines First Day Cover for the ASEAN Architecture 2007. Again the stamps are similar to the ones issued by Malaysia and Singapore which I have shown before this except the stamps bore the filipinas. In terms of size, this is the biggest of all the ASEAN FDCs I received so far. These three stamps, believe it or not is worth 100 pounds each, that's right. Many many times their face values. When they came up on ebay, I had to really think whether I wanted them but luckily for me, no other bidders came and I managed to buy all three for about US$150 which is around $225 our money but still many times cheaper than the almost $900+ on their catalogue value. These three, though have made my entire 1906 stamp collection still 2 stamps short. I have 10 of the 12. I am waiting for the 5cent and $1 stamp to complete the 1906 stamp collection. I wrote about the 1906 in my Golden Legacy column published on Brunei Times but for those who want a short version - these stamps arrived in 1906 in time for the launch of Brunei's official postal services. 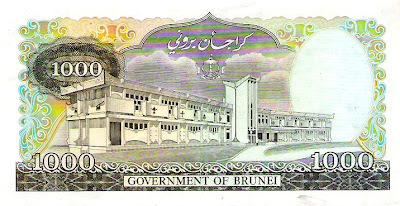 Brunei's own stamps did not arrive in time, so Labuan stamps were overprinted for use in Brunei. I read on BB that Brunei visitors are the third largest contributor to Malaysian economy. I did not realise that we travel that much to Kuala Lumpur or spent that much there. So for all you Bruneians who travel to Malaysia that much - here is a quiz - is the above $20 bank note real? And if it is, when did you last see the above $20 Malaysian bank note? Answers in the comment box. 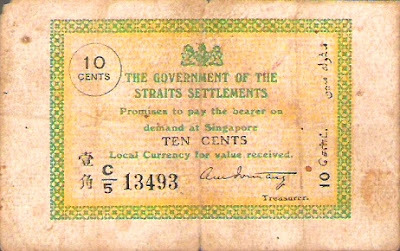 This is the Straits Settlement 1917 10 cent note. This was supposed to be circulated in Brunei under our 1906 Agreement with the British. Whether it actually was distributed is unknown. I did not realise until I have it in my hand that this is not exactly a paper note. It's more like a cardboard note as the paper is quite thick. This is supposedly an emergency issue during the First World War. During the World Wars, metal was scarce and the British in those days issued currency in paper notes rather than coins. This particular note was also printed in Singapore by the Survey Department. There is another 10 cent note issued during the same years (1917 to 1920) but printed in England. I will do the posting on this other paper note tomorrow.